How many terms do you have in the academic year? Are you an English medium school? What ages do you cater for at Oakhill? We accommodate children from Grade 000 (4 years old) to Matric. Classes are small and intimate and vary according to grade. If you require any information on school fees, please contact Lyndall Hill at Admissions, or view our FEE STRUCTURE page. What is your admissions procedure? An ADMISSIONS PACK can be downloaded from our webpage and the procedure is clearly indicated in this document. Families are interviewed by the Head of School and a copy of the students’ latest report must be submitted. What is your Matric pass rate? 100% since our first Matrics wrote the IEB Senior Certificate in 1994 but we would prefer to be judged by how our young men and women cope at University and life thereafter. What subjects do you offer at Oakhill? 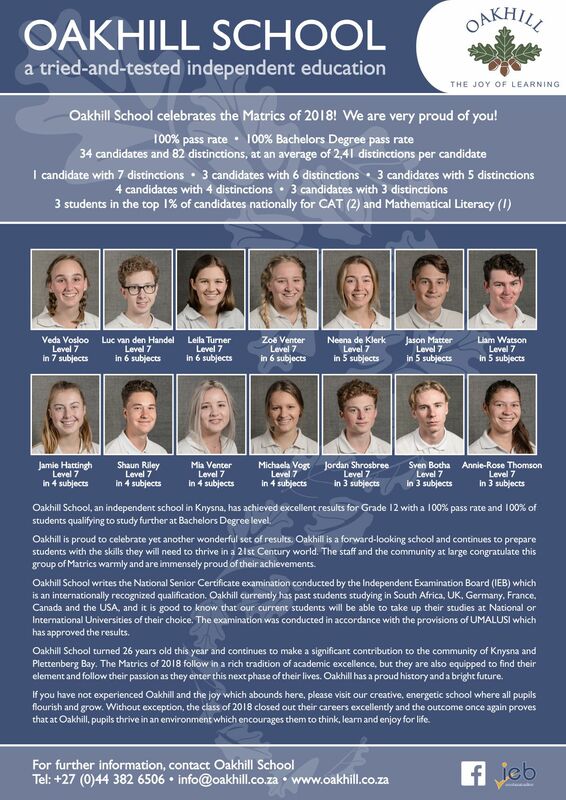 Our Matrics write the Independent Examinations Board (IEB) National Senior Certificate which is internationally recognised. Yes, we do and our CLOTHING SHOP is situated on the school campus. Are you affiliated to ISASA? Yes, we are affiliated to the Independent Schools’ Association of Southern Africa (ISASA). Yes, and we participate regularly in fixtures in our area and further afield. We see our task as developing the whole human being so it only makes sense to have all pupils involved in Art, Drama and Music as well. Where do most of your pupils come from? Most live in and around Knysna. We do, however, have a bus system that runs between Plettenberg Bay and Oakhill. We bus in approximately 100 students on a daily basis. Do you offer extra lessons? All of our teachers are obliged to assist pupils in their classes who may be struggling. Most of our major academic departments offer lessons in the afternoons throughout the week. Pupils who have specific learning or concentration difficulties will be referred to our Learning Support Unit. We are a small school which is characterised by good relationships between staff and students, seniors and juniors, employers and employees. We value the joy of learning and a happy, friendly environment for growth and development is something that is frequently remarked on by visitors. Bullying cannot be tolerated in an environment which prides itself on good relationships because we would destroy what we hold most dear. No doubt rare occurrences of bullying occur but they are treated in a very serious light. The best advice that we could offer any new parent on this important issue is to speak to other parents, and contact the Headmaster should there be any concerns. Oakhill School is entirely free of drugs most of the time. However, young men and women in our society are under threat and we don’t try to hide the reality of the threat posed by all forms of substance abuse. We adopt a proactive approach, which involves discussing it during Life Orientation lessons and counseling them where necessary. 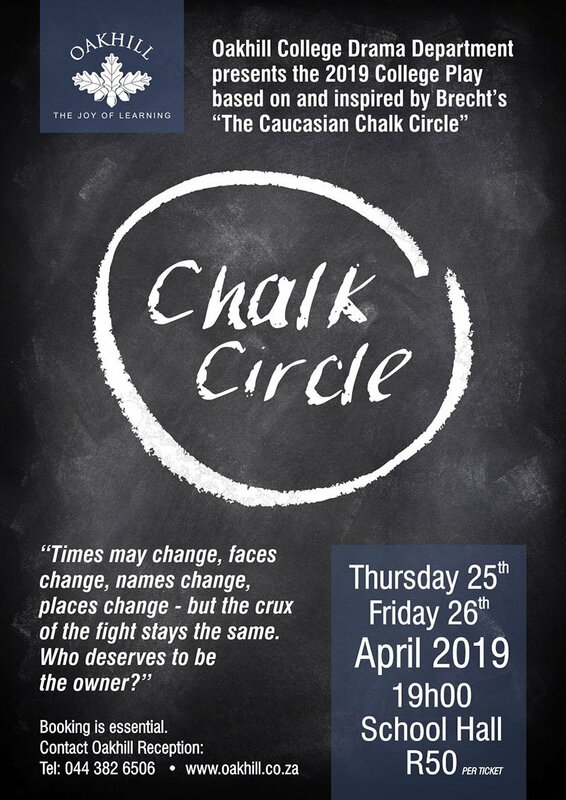 We will not however, ignore this issue and if necessary will ask pupils to seek professional help or in some serious cases leave our institution. Once again, we would suggest that you take a walk around our campus and experience the ease with which our students of all backgrounds interact with one another. While we accept that we have made huge strides in this area we certainly acknowledge that we need to continue to encourage the need for transformation.